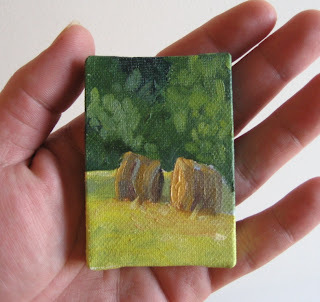 These little oil paintings make me so happy. 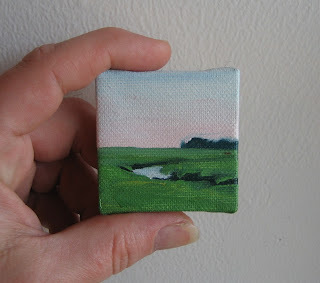 I love when something can perk up your day just by looking at it, these little landscapes do that to me. 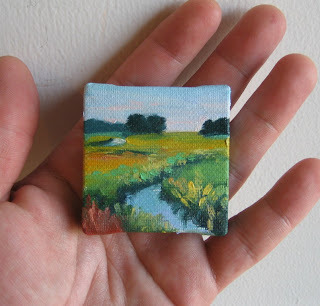 North Attleboro artist, Kim Morin Weineck creates these minuscule landscapes with oils on tiny stretched canvases. 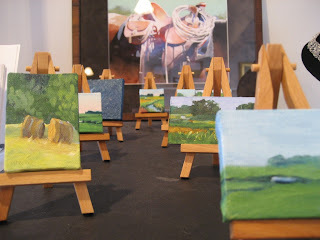 They are sold with little easels to stand them on, and are very affordable for an original oil painting. These little works of art are only $40. Her paintings are all about comfort, and it shows. I am the proud owner of this little masterpiece. I placed it in my own studio on my workbench for inspiration anytime I need it. If you are in the Norwood area, please stop by Custom Art Framing and Gallery 9 to view more masterpieces by many talented artists, along with Kim's full size works. They are truly a sight to behold. I love these! I am currently working on similar minis, only photos mounted on canvas. I am really enjoying the results. Thanks for this! Oh gosh, I LOVE these. OMG - in the first pic - looks like these are HUGE! When I scrolled to read I was so surprised - I love these little guys! You are very talented!! !